A fine acoustic piano entices musicians to perform with enthusiasm, spontaneity and passion. Yet, the satisfaction that one enjoys when hammers strike the strings is often diluted by traditional piano silencing techniques. 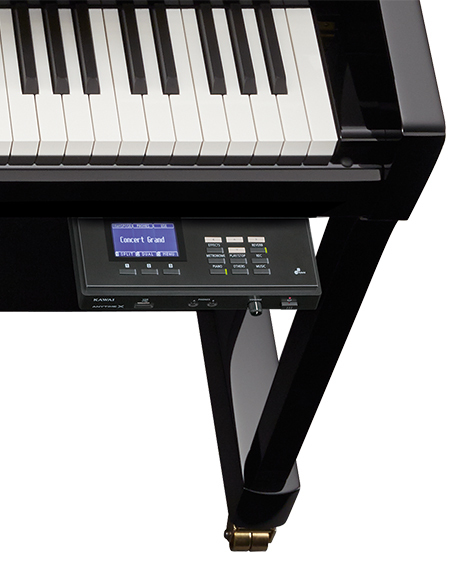 Sensors located below the keyboard struggle to accurately interpret the subtleties of musical expression, which is why AnyTimeX2 integrates sensors within the fine workings of the piano action, reading the precise movements of each hammer. Whether performing rapid passages that demand the same key be played repeatedly before returning to its natural starting position, or pianissimo pieces desiring the very softest of key strokes, the Integrated Hammer Sensing System (IHSS) represents the elaborate nuances of every note. Pianists can finally enjoy absolute privacy without sacrificing the responsive touch and authentic expression of a traditional acoustic piano. AnyTimeX2 features an innovative slide-out control panel, hidden under the keybed, with a gentle push revealing an LCD display and array of function buttons. Digital operation greatly extends the capabilities of the AnyTimeX2 beyond that of a traditional acoustic instrument, with convenient transpose and tuning facilities, a metronome and song recorder, and a selection of high fidelity sounds suitable for various musical occasions. Dual headphone sockets provide greater flexibility for academic institutions, while other connectors allow a range of creative music-making opportunities. The sound of hammers striking strings, resonating through solid spruce. Warm vibrations that illuminate a room, leaving its audience enchanted. The natural voice of an acoustic piano is truly unmistakable. A fine piano entices musicians to perform with spontaneity and passion, yet such unbridled expressiveness may not always be appropriate. Indeed, in certain environments, an acoustic piano can prove disruptive; the diligent tones of children practising scales are unlikely to be welcomed by other family members wishing to watch television, while even the most gentle, soothing Chopin preludes have the potential to irritate neighbours if performed after an acceptable time. AnyTimeX2 incorporates an acoustic muting feature with powerful digital audio components, allowing pianists to enjoy the distinctive feel of a traditional piano while listening discreetly using private headphones. Supplementing the beautiful acoustic piano voices, AnyTimeX2 also features an excellent selection of additional sounds, ranging from electric piano and drawbar or church organ, to strings, and other instruments, inviting musicians to add variety to their performances. AnyTimeX2 features several keyboard modes. The Dual playing mode allows two different sounds, such as grand piano and strings, to be layered together, while the Split and Four Hands modes divide the keyboard into two independent sections. The volume balances and can be adjusted quickly and easily. 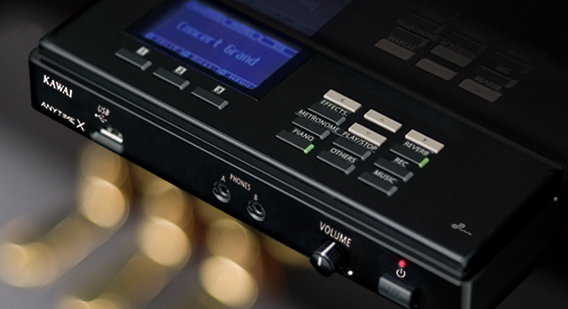 AnyTimeX2's powerful new digital effects engine further enhances the instrument's superior core sounds, applying additional layers of detail and realism that bring performances to life. Studio quality chorus, tremolo, delay, and auto-pan effects can be used to tailor a sound's character and feeling, with modelled amplifier/speaker simulations applying vintage warmth to electric pianos and trademark growl to drawbar organs. The depth of a performance can then be transformed using the updated reverb features, allowing pianists to position themselves within one of six acoustic environments, ranging from a small practise room to a grand cathedral.